Home > Grown-Up Birthday Party! 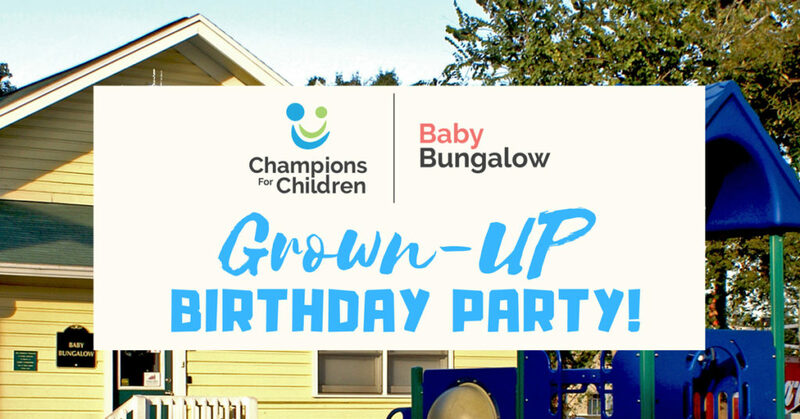 For 20 years, Baby Bungalow has been a beloved resource for parents in the Tampa community to bring their young children to learn together and strengthen parent-child bonding through guided play. Unfortunately, our playground lost its shade when a beautiful old oak tree had to be cut down for safety reasons, and now we need YOUR HELP to once again make the space safe and suitable for outdoor play and programming! This celebration will be the culmination of a two month campaign to raise $15,000 for a new shade structure and other improvements to the playground. As a program of Champions for Children (a nonprofit org), Baby Bungalow is able to offer our high quality and unique family services at low- or no-cost. However, when urgent or unexpected needs arise, we count on the generous support of alumni families and neighbors just like you. Interested in helping? Here are a few ways! (4) Start a personal Facebook fundraiser to help us meet our goal. RSVP via Facebook, or contact jgoodman@cfctb.org for more information.